This article is about the specific celestial body from The Legend of Zelda: Majora's Mask. For other uses of the term "moon", see Moon (disambiguation). Official artwork of the Moon from The Legend of Zelda: Majora's Mask 3D. The Moon (月, Moon) is the main threat of The Legend of Zelda: Majora's Mask. The Moon as it originally appeared in Majora's Mask. The Moon, controlled by Skull Kid under the effects of the titular mask, is the constant threat of The Legend of Zelda: Majora's Mask. Link is given three in-game days to save the land of Termina from the Moon's destruction (however, he can turn back time with the Ocarina of Time). If he fails to do so, the Moon crashes into Termina and destroys the world in the "game over" sequence, which serves as the inspiration for the Moon's role as an Assist Trophy in Ultimate. The Moon, in the background of Great Bay. The Moon cameos in the background of Great Bay. After three minutes pass, the moon will begin to fall towards the stage, before the Four Giants push it back up into the sky. 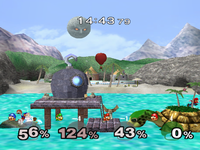 The Moon also appears as a trophy in Melee. The Moon trophy from Melee. High in the sky above the Clock Town Tower, a menacing moon slowly sinks towards the city. Shrouded in mystery and feared by all, it threatens to devour everything and everyone in a cataclysm of fire. Strangely, inside the moon is a beautiful, pristine plain broken by a single tree. The moon breaks after Link defeats Majora's Mask. The Moon, in the background of Great Bay in Ultimate. The Moon reprises its role as a background character in Great Bay, which returns from Melee. Its appearance has been updated to match its style in The Legend of Zelda: Majora's Mask 3D. The Moon approaching the Ω form of Find Mii, in which Shovel Knight, Villager, Samus, and Palutena are standing on. The Moon also appears as an Assist Trophy. When summoned, it appears as a miniaturized version of itself before respawning in the background and making a collision course towards the area of the stage where the opponent was when it was summoned, becoming more fiery as it gets closer. Once it hits the stage, it deals multiple hits before disappearing, doing 60% damage on a target if all hits connect. Training Mode describes the Assist Trophy: Falls from the sky and causes a massive explosion when it hits the stage. Can't be KO'd. The Assist Trophy cannot be summoned on the Luigi's Mansion, Great Bay, New Donk City Hall, Midgar, Pac-Land, Duck Hunt, Gaur Plain, Boxing Ring, Wii Fit Studio, Gamer, Palutena's Temple, Flat Zone X, The Great Cave Offensive, PictoChat 2, Living Room, Balloon Fight, Reset Bomb Forest, Arena Ferox, Prism Tower, Unova Pokémon League, Dream Land GB, Spirit Train, Paper Mario, Golden Plains, Hanenbow, Mario Bros., and the 75m stages. The Moon as an Assist Trophy in Super Smash Bros. Ultimate. The Moon impacting the Ω form of Pirate Ship, catching Luigi, Mega Man, and King Dedede in the blast. The Moon nearing the Bridge of Eldin with Ganondorf facing it. The Moon approaches Find Mii. The Moon is one of two Assist Trophies who can't be summoned on more than one stage, the other being Andross. This page was last edited on April 8, 2019, at 19:34.